Buy car batteries in Athens at a Firestone Complete Auto Care near you. Make an appointment online to have your current car battery tested or get a new Interstate battery installed today! Are you waiting until your car won't start to get a new truck or car battery? Your vehicle needs a strong battery to deliver the power your engine needs to get up and go. In Athens, Firestone Complete Auto Care is the shop to visit for battery service, testing, and replacement. If you're experiencing a slow engine crank or your check engine light is on, your battery is crying out for help. Corrosion around the terminals, low fluid, and a bloated case are also clues pointing towards a battery that's about to call it quits. With the help of our technicians, you can drive off with the right battery at the right price—before you're stuck with a car that won't start. 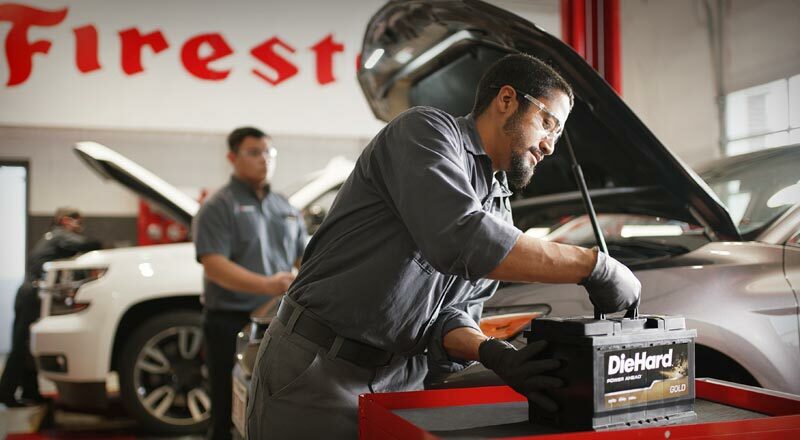 Visit your local Firestone Complete Auto Care for a free battery check in Athens. We can tell you how much longer your battery will live, along with the temperature it could quite. Our technicians can help you choose the best car battery for your budget, climate, and vehicle type. We install over 800,000 batteries each year using America's #1 replacement battery, Interstate Batteries. They're leaders of the pack when it comes to performance and reliability, and that's technology we can get behind. From testing to replacement to recycling, our services help ensure that your car or truck runs strong, no matter the season. There are hundreds of moving parts in your car, all of which need to stay well-tuned. Your automotive battery may give your car the power it needs to get started and stay running, but other parts are important too. There's your engine, tires, brakes, steering and suspension, alignment, filters, and more! Firestone Complete Auto Care in Athens is the place to go for all of it. You'll receive the best in total car care, from your oil filter to your exhaust pipe! So whether you need a dead battery replaced, you're shopping for new Firestone tires, or you need brake pads replaced before work, make an appointment online and come to Firestone Complete Auto Care. Highly skilled technicians are standing by to care for your vehicle the right way. From drivetrain services to steering and suspension to tire repair, trust your nearest Firestone Complete Auto Care for your automotive service needs. We're your all-in-one tire store, car care center, and automotive shop. Our highly qualified technicians work hard to help ensure that your vehicle runs the way it should. When you bring your car or truck to us for maintenance, we promise quality service at an affordable price. Explore our services and at your convenience, schedule your next courtesy check or repair in Athens, Ohio today.